Gaming laptops are usually chunky beasts - the sort of thing that will give you shoulder ache and win you odd looks should you dare to take them out of the house. The Gigabyte P34G v2, however, is something quite different. It has serious gaming power, but a look that's much more Ultrabook than ultra-nerd. You could happily take it out in a Starbucks to do a bit of work or web browsing without earning snorts from the MacBook brigade. But with cooling fans that can sound like a miniature jet engine and a very much sub-ultraportable battery life, the P34G v2 is not perfect. But it could certainly be the perfect compromise for some. The Gigabyte P34G v2 does not indulge in any of the usual gaming laptop nonsense. There are no whacky fonts on the keyboard, no red keyboard backlights and no overblown heat outlets that look like they belong on a souped-up Vauxhall Nova. It's a refreshing look if you want something altogether more casual. 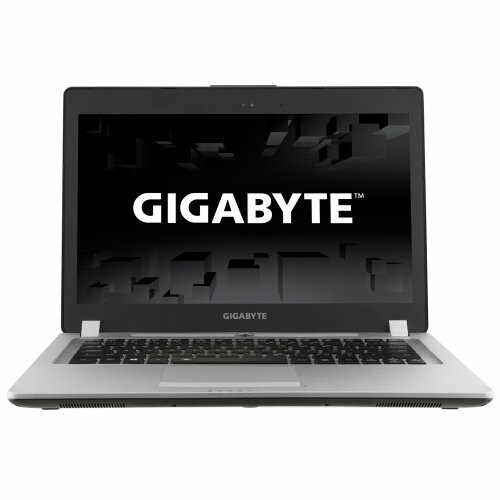 Instead, the Gigabyte P34G v2 is a fairly sober-looking silver-colour laptop. With a 14-inch screen and a 20.8mm thick 1.7kg frame, it's not particularly big or heavy. High-end gaming laptops from Alienware will often be so heavy that you can't realistically carry them around like a normal laptop. Not so with the Gigabyte. However, Gigabyte is not a master of build quality in this instance, and it does show in the P34G v2 more than a bit. It's more the build of a decent £700 laptop, not a £1,000+ Ultrabook. The bottom is plastic, and while the keyboard surround and lid are metal, they aren't put together with true finesse. The best Ultrabooks have typically have a unibody vibe, but the Gigabyte P34G v2 feels like what it is - a series of bits joined together. Still, you go get a touch of class thanks to the aluminium lid. Not being too obsessed with making the sturdiest-feeling laptop in the world may be part of how the laptop gets to its pretty impressive 1.7kg weight. This is a pretty serious gaming machine, but only weighs around 100g more than a 13.3-inch MacBook Pro. That's a bit mad when you think about it. So exactly how good is the Gigabyte P34G v2 for gaming? As long as you don't mind the just-ok build, it's the most important question here. The laptop uses an Nvidia GTX 860M GPU with 4GB of its own RAM. This is a very serious card among laptops, and will let you play most games - even those of the last few years - at top or near-top settings, including anti-aliasing. It's the real deal. We tried a bunch of games released in the last few years, including Medal of Honor, Bioshock Infinite and Two Worlds II. The Gigabyte P34G v2 chomped through them with no performance issues. For a slim-ish laptop, it's a real beast. However, it doesn't half snarl too. After gaming for a short while, the fans will really start kicking in. At their worst, it sounds like a miniature jet engine preparing for take-off. They'll often kick in when you're not gaming, too. You only seem to hear this aspect of the Gigabyte P34G v2 at full volume when it's plugged in, though. When gaming off the battery, the fans seem to keep relatively quiet. It's still very noisy for a small and light laptop. The heat exchange system is designed for fan use too. Some of the heat outlets are on the bottom, and we found that just by leaving the laptop on a leather sofa virtually idle was enough at times to set off the fans. Which makes sense, but is worth noting so you don't rest it on a pillow, carpet or such like when trying to get the most out of it. If you want a laptop to use in very quiet environments without disturbing anyone, them the Gigabyte P34G v2 probably isn't the way to go. You also need to consider that thanks to its performance-centric specs, the battery isn't going to last through a full day's work. As it's more of an entertainment laptop, we tested its stamina with more of the fun stuff rather than work to see how it lasts. Test one was streaming video: all day long - or as much as the Gigabyte P34G v2 can handle. We found it'll last for 4.5 hours when streaming video via YouTube. It's nowhere near what you'd get from a MacBook Air or a high-stamina Ultrabook, but it's actually pretty good when you consider the Intel Core i7-4710HQ CPU that Gigabyte has packed in to the P34G v2. This is a high-power quad-core 2.5GHz CPU, but the thing to note is that it's an "HQ" series Intel CPU. Just about any laptop that's out to offer stamina uses a U series one, designed more for efficiency than flat-out power. Don't buy this laptop if you're out for something that'll last through a full day's work (if we can call gaming work). Get the Gigabyte P34G v2 playing GPU-challenging games when release from the mains and the battery will only last for 90-100 minutes. It's no surprise given the weight of this laptop and the engine humming (often literally) inside it. Fatter, heavier gaming-centric laptops crammed with larger batteries will last a lot longer. But you can do a bit of outdoors gaming on the Gigabyte P34G v2, as it uses a fully matte, non-touch display. Reflections are no issue and the 14-inch 1920 x 1080 pixel screen provides surprisingly good image quality. Contrast is excellent for a laptop screen and colours are very strong. A 1080p display feels like a great fit too for gaming: in a 14-inch screen 1080p is sharp enough to satisfy and isn't going to put an undue strain on the graphics card when playing games at native resolution - as a 2,560 x 1,440 screen might, for example. Some of you may not instantly fall in love with the character of the matte screen, though. As expected there's less glossy sheen than what you get in the vast majority of £1,000+ laptops. The Gigabyte P34G v2 also has an old fashioned screen surround where style laptops generally have a single-surface glass top level that both looks and feels better. When you're not dealing with a touchscreen though there's no real practical downside. It's just about the look. By now you should have some idea of whether the Gigabyte P34G v2 would be right for you. Not a gamer? Don't bother. Want a gaming laptop that's also pretty portable and doesn't scream draw attention? You're looking in the right place. But what about the laptop's little extras? The Gigabyte P34G v2 has four USB ports, two are USB 3.0. And you get most of the other connections you could also for - HDMI, VGA, SD and Ethernet. You can easily plug the laptop into a separate large screen or monitor if you so wish, and there are enough USBs to attach a keyboard and mouse while leaving a couple of others for external hard drives. Having a USB or two more than the average Ultrabooks is a very sound move for a laptop like this. We do think the keyboard and mouse trackpad could be a little better, though. There are some signs of the Gigabyte's familiar so-so build quality in the mouse buttons - there's a big, undefined dead zone in-between the mouse button zones when, given they're not built into the trackpad, the laptop might as well as have totally separate left and right buttons. The keyboard layout is pretty standard and easy to get on with, but the key action doesn't have quite the same definition as some rivals. You'll get used to it, but it's a compromise to bear in mind if gaming isn't your top concern. The size of the laptop can also become a bit of an issue. With a 14-inch laptop, it's a bit too easy to brush your hand against the trackpad when using the WASD keys of a first-person shooter. Of course, plug in a mouse, disable the trackpad and the problem disappears. The internal speakers aren't too hot either, with none of the low-end grunt that you might get in a laptop that puts a bit more attention into this area. A MacBook Pro 13.3's speakers are much better, for example. For gaming on the go, get those headphones on. Other areas of the spec will depend on which version of Gigabyte P34G v2 you buy. You'll get at least 8GB of RAM, but there's a pretty wide array of SSD and HDD configs on offer too. The commonest appears to be a 1TB hard drive, giving loads of room for game installs, but there are also versions with 128GB or 256GB SSDs, or even multiple SSD drives. Naturally, this adds a fair bit to the baseline £1159 cost. If you thought gaming PCs had to be big, heavy and ugly, then think again. The Gigabyte P34G v2 can't hold a candle to most £1,000+ Ultrabooks in the battery life or looks departments, but it's a discreet and portable laptop with serious gaming power. Play recent games at decent settings no problems, and the P34G v2 will even double as an occasional portable laptop if you want too. However, it's loud as anything when you push the CPU/GPU, but the amount of power squeezed into this small and fairly light laptop is seriously impressive. Gamers on the go take note: the Gigabyte P34G v2 is a savvy choice if you're after something more casual than many brands offer.